Companies expected to pay for a Superfund cleanup of the Portland Harbor have $125,500 less to worry about. The U.S. Environmental Protection Agency has backed off from fining those companies for dragging their feet on reporting the risk people face by eating contaminated Willamette River fish. The EPA on Monday told the companies it is suspending the fines it began issuing last summer -- on the condition the companies turn in acceptable reports on other pollution in the river. Environmental regulators levied the $125,500 fine in April on Lower Willamette Group -- a coalition of 12 harbor businesses, plus the city of Portland and the Port of Portland -- for providing reports of "unacceptable quality" about the risk people face by eating contaminated Willamette River fish. The EPA almost immediately caught flak from powerful leaders, including members of the Oregon congressional delegation. But EPA officials now say the companies have delivered new, adequate reports on how dangerous the fish are. The government plans to drop the fines entirely if the Lower Willamette Group delivers the rest of its pollution studies by next spring. The reports will guide the EPA in choosing a degree of cleanup for the toxic Portland Harbor -- and depending on what level of cleanup the EPA selects, the costs of the full harbor cleanup could range from $169 million to $1.7 billion. EPA officials say they're dropping the fines because they want a fresh start in cleanup efforts that had been mired in petty bickering. "Basically, what we've really seen in the last 8 months is a renewed commitment on the Lower Willamette Group's part to deliver a study," says Rick Albright, director of the EPA's Office of Environmental Cleanup in Seattle. "This decision is based upon the good-faith efforts that I have seen from the Lower Willamette Group." Portland Mayor Charlie Hales praised the decision. "The EPA is acknowledging that good communications and good cooperation between all parties is the key to success," Hales said in a statement to WW. "And we define success as reaching an actual plan to clean up the Willamette River... A 'reset' in relations, and the good-faith effort of the Lower Willamette Group, lets us move forward to craft that plan." The EPA is also reducing the political blowback it received as soon as it issued the fine in April. Members of the Oregon congressional delegation -- Sens. Jeff Merkley and Ron Wyden and Rep. Earl Blumenauer, all Democrats -- complained to EPA officials about the fine weeks after it was levied. The Oregon delegation also pressured the incoming EPA administrator, Gina McCarthy, to shift oversight of the project to the nation's capital. As WW reported earlier this month, the heat came from officials including Blumenauer -- whose wife, Margaret D. Kirkpatrick, is senior vice president and general counsel for NW Natural. The gas company is a member of the Lower Willamette Group. Albright says the decision to suspend the fine was made without interference from Washington, D.C.
"They did not play a role," he says. "I had nobody from the congressional delegation contact me either directly or indirectly since this went into dispute." 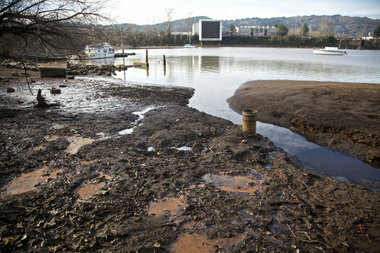 Travis Williams, the director of environmental advocates Willamette Riverkeeper, says he understands the EPA dropping a small fine on the condition of getting cooperation on a cleanup that could cost billions. "I think the larger point is the EPA sent a message that they wanted the working relationship to be different," Williams says. "There's hope they have achieved that." Barbara Smith, spokeswoman for the Lower Willamette Group, wrote WW on Monday. "We are disappointed the penalty was not withdrawn," Smith says. " However, we are encouraged with EPA's recognition of the LWG leadership... We also are encouraged by EPA's desire to 'reset' the relationship with the LWG."